The Academy of St Martin in the Fields (ASMF) brought an utterly delightful matinee concert at the BBC Proms under their music director, violinist Joshua Bell. The joys were manifold. For one thing, it was a beautifully varied bill, including a couple of rarities. But above all this was a concert that demonstrated the pleasure of making music together, by a first-class ensemble of 40 musicians breathing as one and visibly enjoying their moment in the spotlights. Acting both (or simultaneously) as conductor and as soloist, Joshua Bell appeared a true inspirational force. Conducting from the leader’s chair (if not playing, wielding his bow as baton) in Mendelssohn, Bridge and Beethoven, he went centre stage to play and direct Saint-Saëns’ Third Violin Concerto. And all from memory. The concert took off with Mendelssohn’s Overture for A Midsummer Night’s Dream. The woodwinds had a bit of a rough start but pretty soon everything fell into place and this rendition was teeming with youthful energy and imagination. The different scenes and moods of Mendelssohn’s microcosmic distillation of Shakespearean fantasy came vividly alive now with transparent textures, then again with warm colors and subtle shading. While Bell kept things going at a lively pace, the sound quality of the ASMF was outstanding throughout. The concertos from Camille Saint-Saëns are rarely heard in the concert hall. Of his five Piano concertos only the Second is occasionally performed, and his Violin concertos fare even worse. And come to think of it, his symphonies aren’t exactly flooding the concert programs either. Interesting to read in the Proms program notes that Saint-Saëns was pally with Proms founder-conductor Henry Wood and that his Third Violin Concerto was a popular favorite at the time, receiving no less than 16 performances between 1898 and 1928 – although apparently only the slow movement initially. But only one in the following 90 years (in 1989). The current revival by the ASMF was in this respect all the more welcome and with Bell’s authoritative reading we couldn’t have had a stronger advocate to get this lovely piece back in the mainstream concerto repertoire. It was quite a stunning tour de force for the soloist/conductor, alternatively facing the public and his orchestra. 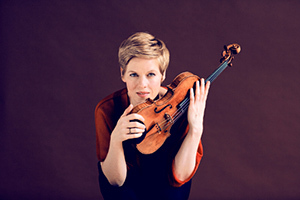 Ever graceful in projection and warmly attractive in timbre, Bell immediately hit the right balance between virtuoso display (it was written for legend Pablo de Sarasate after all) and romantic lyricism. The barcarolle-like Andantino quasi Allegretto sung in all its elegance, fusing violin with woodwinds in a ravishing dialogue. Naturally, Bell was the soloist and he got the brilliant parts (which he negotiated effortlessly), but the success and conviction of this reading was eventually due to the admirable teamwork, or rather companionship, between him and the orchestra. As said, an irresistible sense of making music together was running strong the whole concert, but this quality was never more palpable as in the concerto. After the interval Bell and the string players of the Academy performed Frank Bridge’s short Lament, composed to commemorate the brutal sinking of the “Lusitania”, a British ocean liner by a German submarine in 1915, taking 1,200 passengers to the bottom of the Atlantic. Bridge was friends with the Crompton family who perished in the disaster and composed this 5 minute Lament in memory of 9-year old Catherine Crompton. Again, a rarity for the Proms as the piece hadn’t been performed there since its premiere in 1915. A remarkable work in its dense but subtle string writing, and most impressively done here. In order not to interrupt the impact of the memorial piece Bell wanted to segue from the Lament into the following Beethoven Fourth Symphony, however due to a slight hesitation of his part all good intentions were torpedoed by premature applause from eager Prommers. Still, once under way after the searching introduction, this Beethoven was pure sunny joy, excitingly muscular and crisp in the outer movements, warm and tender in the Adagio, but always full of ‘joie de vivre’. A convincing orchestral balance, clear textures, excellent solo work and impressive dynamics highlighted the quality of the ensemble again and under Bell’s direction the whole work seemed infused with an unstoppable drive running through all the movements. To his credit, Bell clearly doesn’t consider the Fourth Symphony a mere “divertissement”, but really a worthy companion for the usually higher esteemed Third and Fifth. It didn’t matter this was a small ensemble playing the gigantic Royal Albert Hall, this sweeping account of Beethoven’s Fourth made a very strong impression indeed. It is now 7 years that Joshua Bell took over the music directorship of the ASMF from the late Sir Neville Marinner, but judging from this concert the orchestra is in the best of hands and can definitely look forward to its 60th anniversary in the 2019/20 season in full confidence. Categories: Concert reviews | Tags: 2018, Academy of St Martin in the Fields, ASMF, BBC Proms, Camille Saint-Saëns, Felix Mendelssohn, Frank Bridge, Joshua Bell, London, Ludwig van Beethoven, Lusitania 1915, Marc Haegeman, Neville Marriner, Royal Albert Hall, Violin concerto | Permalink. 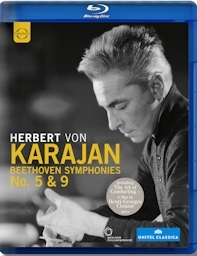 EuroArts has paired two remarkable historic films of Herbert von Karajan conducting the Berlin Philharmonic in Beethoven on Blu-ray. Both the 1966 Fifth directed by Henri-Georges Clouzot and the 1977 New Year’s Eve Ninth are surely familiar to collectors, yet these fascinating documents receive now a welcome high-definition upgrade. The performances are in a class of their own, with the studio-recorded Fifth gaining immensely from the aesthetic vision of Clouzot and the live Ninth remaining a particularly fine demonstration of the Karajan-Berlin team at the top of their game. French director Henri-Georges Clouzot produced in 1965-67 with Karajan a series of music documentaries dubbed “The Art of Conducting”. They may initially have been intended to acquaint the general public with some of the mysteries of orchestral direction, yet even with only 5 of the projected 13 films completed, they eventually solidified more than anything the image of Karajan as the all-powerful and infallible maestro. The visual and dramatic qualities of these films (they are indeed more “film” than filmed concert), as exemplified here by Beethoven’s Fifth, become all the more apparent when seen alongside Humphrey Burton’s efficient but conventional direction of the New Year’s Eve concert some ten years later. Don’t be surprised to find musicians changing places in this film (like the flutes are suddenly appearing to the right of the oboes in close-ups, only to be in their regular position during longshots). Shot in a stunning true “film noir” black and white, it’s all part of Clouzot’s imaginative and ultimately musical vision. Even almost 50 years after date, this prime example of “music to watch” has hardly ever been surpassed. A box-set release of the whole series of these groundbreaking films in HD may well be out of reach, so we better treasure what there is. (Dvorak’s Ninth and Mozart’s Fifth Violin Concerto with Yehudi Menuhin from this series were released on Blu-ray by the C-Major label, but Verdi’s Requiem and Schumann’s Fourth Symphony are still awaiting their HD upgrade). In a 20-minutes bonus we see Karajan demonstrating an apprentice conductor how to rehearse the slow movement of the Fifth Symphony, and in conversation about the purpose of the series. Again, the maestro in total control of every detail. The 1977 New Year’s Eve concert is one of Karajan’s best renderings of Beethoven’s Ninth, characteristically built on rock-solid basses and surging forward and upward with an extraordinary sense of shape. The last movement is particularly exciting, with a fine quartet (a superb José Van Dam) and excellent choral singing. Karajan conducts the singers with open eyes and on several occasions you see him watching them with admiration, carried away by the beauty of the moment. Even he was after all only human. Burton’s direction may be conventional, but at least he knew how to preserve this concert as a true event. The 1966 Clouzot film looks very well in HD, rich in contrast, sharp and detailed. The damage appearing on the title cards initially lets you fear the worst, but the film itself is in much better shape. The 1977 concert is in color which shows its age more. Especially the images of Karajan – shot in his then preferred manner against a sidelight – appear quite dark and grainy compared to the better lit orchestra members and singers. While EuroArts announces PCM Stereo only the Ninth is in stereo (the previous DVD release of this concert included a 5.1 DTS Master). As it is, the sound is totally agreeable, detailed and with an especially impressive dynamic range for the concert. Highly recommended. Categories: Blu-ray and DVD reviews | Tags: "The Art of Conducting", Berlin Philharmonic Orchestra, Berliner Philharmoniker, EuroArts, Henri-Georges Clouzot, Herbert von Karajan, Humphrey Burton, Ludwig van Beethoven, Ludwig van Beethoven: Symphony #5 in C minor, Marc Haegeman | Permalink.